This year was full! It was full of learning, getting out of my own way, and growing my mindset. I wore several hats this year, as a student, coach, consultant, contractor, professor, and business owner. I want to share some of my accomplishments, areas of growth, and reflections from the previous 365 days. I started off the year by completing my application to be certified as a LGBT-owned business, or a LGBT (Lesbian, Gay, Bisexual, Transgender) Business Enterprise. This certification is important to me and was a fairly simple process. I found out about it from our local LGBTQ Chamber of Commerce, Quroum, of which I’m a member. I completed the application online, participated in a site visit, and received my decision a couple weeks later. You can find out more information here to apply with NGLCC. January through May, I taught a Gender Studies elective course for first-generation students at Metropolitan State University. This is such a fun group of students to work with. The group is 25 first-year students in the TRIO Program. We had a great semester. In June, I was honored as one of the keynote speakers for the Summer Institute, co-hosted by Consortium of Higher Education LGBT Resource Professionals and National Black Justice Coalition at North Carolina Central University. 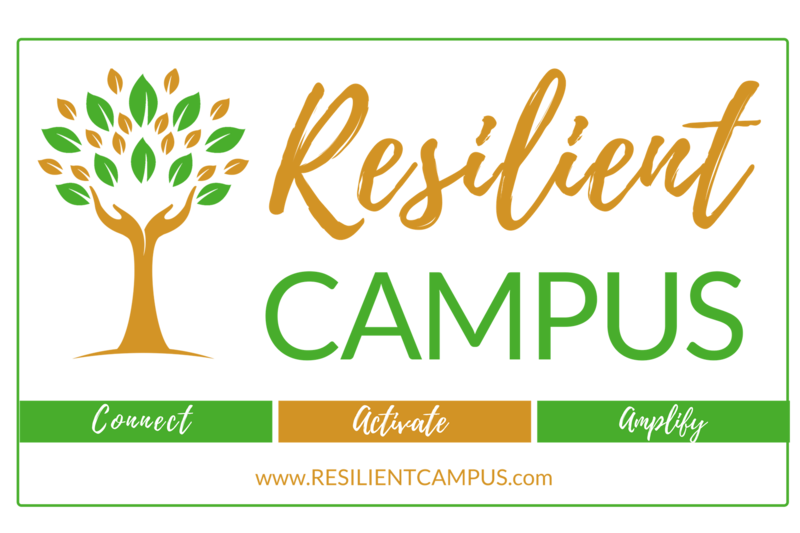 Regarding the internal workings of Resilient Campus, I revamped the logo and tagline for Resilient Campus. The logo changes were fairly simple and I made them for logistical reasons. I wanted the logo to be more suitable for printing and viewability in digital locations. I removed the gradient colors and created a rectangular line around it to enclose it. I changed the tagline from “Empowering Resilient Campus Leaders” to “Connect. Activate. Amplify.” This tagline is to ready the organization for its next phase of life, which will center on personal and professional development resources, courses, and the online community environment. In July, I launched the Resilient Campus Podcast. This was a very exciting and long-term aspiration of mine. If you know about my slow learning curve for technology, podcasting was overwhelming to me. It required so many technical skills and I wasn’t sure how long it would take me to learn all the skills and technology necessary. Luckily, I hired an awesome coach named Regina and over a 6-week period, she helped me to launch the projects that had been swimming in my brain for quite some time. Interviewing amazing college inclusion innovators for this podcast has been such an honor. It’s so humbling to hear from those on the frontlines of college social justice movements and I’ve learned so much from them. They inspire me, they re-energize me, and they give me hope. I published six episodes in 2017 and have four episodes awaiting editing and transcription for release in 2018. After I had a handle on creating and editing the episodes, I’ve outlined the equipment and considerations for other people interested in creating a podcast. I want to empower others to utilize this power platform for storytelling and visibility. In July, I also created an online community using an app called Mighty Networks. This social networking app is great for connecting to new people based on interests and location. I created the community infrastructure and the next iteration of this community will be announced soon. I had been dreaming up how to use social networking sites to create a place where college professionals could convene, grow their community, as well as provide and receive support. Announcing this community was just the beginning. There is much to do with this project. Stay tuned in 2018 for more details! In September, I published my first book(s)—that’s right, more than one!—and did so quietly. I published the Student Internship Success Workbook series, one workbook for college student interns and one for intern supervisors. I had the honor of consulting with a local college internship program serving students of color and first-generation students. We piloted a semester-long curriculum focusing on career readiness and personal growth. I learned the technical side of self-publishing books from multiple online courses and resources. With this new knowledge and feedback on how to enhance the curriculum, I was ready to convert it to its current printed book form. The workbooks are now available on Amazon and gaining popularity (especially in Europe). September also marked my partnership with Wilbur Wright College in Chicago. What a fierce group of staff and faculty! November was so full! I was teaching a Transgender Identities course and in fact, the semester was in full swing. I started the month in Dubuque, Iowa to present at the Dubuque Chamber of Commerce Diversity Summit, then spoke at First-Generation Student Success Day at in Saint Paul. In mid-November, I traveled to Washington D.C. for my first national student leadership keynote and had such an amazing time. Jeff and Lenny at Trill or Not Trill are awesome partners and did a great job consulting with this year’s National Conference on Student Leadership Conference. The biggest accomplishment, both for myself and my family, is that I earned my doctoral degree. It took a lot of persuading from professors and mentors over many years to persuade me to apply to graduate school. I thought, “Graduate school is for those other people; not me.” It was as if they had me confused for someone who had the abilities to complete something so rigorous. These mentors passed the torch to me so that I can now encourage others to recognize their potential and actively pursue their dreams, whether it’s within formal education pathways or other avenues for growth. I learned A LOT this year! I enrolled in webinars, online courses, read books, and partnered with a coach. I intentionally invested in continuously absorbing new ideas, perspectives, and technical knowledge. I am hyper aware of the “flattening” of teaching and learning thanks to the online environment. I have learned the most from people who are not necessarily professors in their field, but mostly practitioners willing to share their knowledge with others. In 2016, I discovered podcasts when I was commuting each day and this year I listened to a ton of new podcasts. I accomplished two very large projects this year, my 230-page dissertation and the 16-week intern curriculum. When I think about how I completed them and to prevent overwhelm of the next big project (cue the nervous laughter), I had some great strategies that helped out. The first was that I kept a notebook for each project, making notes related to the current tasks I was working on, then making a list of the next tasks that need to be completed. This was SO helpful! When I sat down to the project the next time, I could just begin working on the tasks I listed. I also scheduled out chunks of time where I would work on these projects uninterrupted. Usually 2-3 hours was ideal for me, turning off notifications on my phone and computer, and keeping a big glass of water and a mug of coffee nearby. I checked off one small task at a time, then slowly and surely, one chapter at a time, or one series of lessons at a time. I learned a lot about myself. First, I get overwhelmed with large projects if I view them as such. I also grew tremendously being able to have focused work time on one project at a time. We lose so much time and energy switching between tasks and I enjoy working “in my flow” SO much more. This year has been the most creative year I’ve had in a long time. 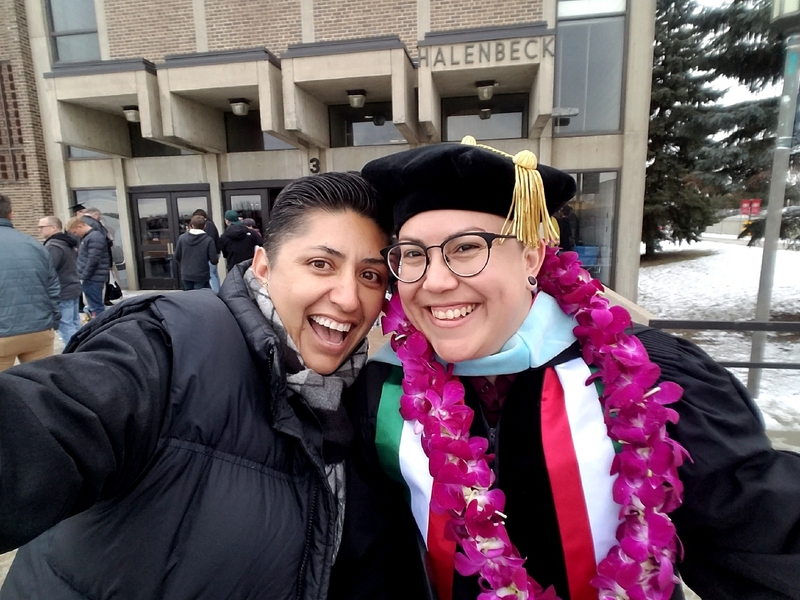 I have been able to read and learn from influencers and authors outside of higher education, then writing about connections to our work in higher education. The world has become this sort of experiential lab where each interaction and new learning has connection to another very different aspect of my life. I will definitely continue this mindset in 2018. I grew my understanding of my own abilities, therefore extending my possibilities. This year has been about demonstrating my abilities as a coach, as a curriculum designer, and as an educator. I created workshops, keynotes, coaching curriculum, train-the-trainer sessions, and this year was about feeling the tangible effects of engaging my skill sets and knowledge. I struggled this year with my daily routine. I work from home most days and this leads to the increased need to regulate my work and personal time investment. I discovered that I love hearing inspirational and motivational speeches. It really energizes me. I created a playlist on Spotify with a series of “locker room” type of inspirational speeches and there is something about them that pumps me up. Just last night, I finally downloaded the “Shine” app and am already in love with the daily impact. I began listening to Sinclair Ceasar’s motivational series about productivity. It is so cool to hear his voice and his words. Sinclair is such a ray of sunshine in this world. Over a year ago, I heard about the book, The Miracle Morning. Not just one podcast guest or author, but several people recommended this book as a game-changer. They weren’t kidding! I started 2018 by listening to and reading through the entire book in four hours. I love it! I am going to implement the Miracle Morning routine into my daily practice so that I start my day with determination, purpose, and energy. I started writing about overcoming self-sabotage and strategies for resilience. I hope to make both books public this year. I am also going to take a couple of writing courses, both in-person and online. I am enrolled in Regina’s course, Start Your Book This Weekend, and will also take a community education course or two for fun. My goal is to write for 10 minutes each day in 2018, whether it’s journaling, mind mapping ideas and projects, or adding to the current book iterations for these two projects. As a small business owner and one-person shop, it is easy to be overwhelmed by the countless administrative tasks required each day. This year, I came face-to-face with my inability to ask for help. Instead of getting help with podcast editing, marketing, and social media strategy, I allowed these areas of my business to slow to a stop. I am in the process of hiring podcasting help this week and have partnered with Kayley Robsham as my social media and marketing genius. The more I get help in these areas, the more time I get to spend creating new partnerships, developing curriculum, writing, and thinking. I’m excited to continue to explore new ways and new people to create impact with. I am honored to partner with Carleton College this week for their Peer Leader Retreat. I start teaching Introduction to Gender Studies soon after and can’t wait to meet the new group of students in this class. In February, I am designing and facilitating a Social Justice Institute with the Montclair State University community. I am most excited to meet new people as I travel to new places and deepen my connections with and my commitment to each of you. Thank you for supporting my work in Resilient Campus. I look forward to inviting each of you into this work in 2018 in new and relevant ways. Wishing you an abundant start to the new year and that each day you see gradual growth in your limitless potential.